Bitcoin! It's everywhere right now. Its value is dropping, spiking, dropping again. More and more new converts are hopping in, buying a few coins and trying their hands at the market, looking to make a quick buck with a profitable exchange. But all the while, there's an ever-dwindling army of specialists working in the shadows, painstakingly extracting more and more digital doubloons from the cryptographic static. What started as a pastime any computer could dabble in has spurred the evolution of truly ridiculous powerhouse Bitcoin mining rigs. Meet the monster machines more powerful than everything you've ever owned, combined. By a factor of thousands. It all started so simply. Just after Bitcoin's birth in 2009, and before its current surge of popularity, mining could be done by a run-of-the-mill CPU in just about any old computer. Back then—and still today—Bitcoins are mined by using computing power to solve a complex cryptographic equation. If your computer is lucky enough (or really, powerful enough) to get a right answer, you'll create coins. So given enough time, a CPU can actually get some mining done. And back in the early days, if you could get free power to run it from your dorm room, library, or office, and the exchange rate was high enough (a buck or two), you could stand to make some spare pocket change. So how did we get from there to giant rigs that consume $150,000 of electricity daily? It was inevitable, really. Especially after Bitcoins actually became worth something. The all-out race for power isn't just some sort of freak side-effect of Bitcoin's surging popularity, though. It's actually built right into how Bitcoins come into existence. The cryptographic hashes miners need to solve to mine Bitcoins weren't easy to begin with, and they only get harder as miners throw more and more collective computing power at them. Bitcoin self-regulates its difficulty so that there's always just a trickle, one block of coins mined every ten minutes. No matter what. So it's not about the quantity of power you've got, but rather your proportion of the whole. You've got to keep up with the Joneses. And because mining is a repetitive task better suited to muscle than smarts, miners suddenly found themselves with an 800-fold increase in hashing power on their hands. Before long, the number of GPU mining rigs—combined with Bitcoin's regulatory difficulties—made massive amounts of power not just an advantage, but table stakes. So where do you turn when everyone's competing with the same horsepower? Volume. This is a multi-GPU mining rig, living in rented warehouse space with three tons of AC for cooling. It was in its prime in late 2011. Two GPUs are better than one, and two dozen are better than two. But when miners started building up to such a macro scale, other concerns started to creep in. Finding space. Keeping systems cool. But the thing that really stood to cut into Bitcoin profits was—and still is—the cost of electricity. And this concern turned miners' affections to yet another, different tool of the trade called FPGAs. While CPUs and GPUs had been co-opted and tweaked for mining, Field-Programmable Gate Arrays were the first devices with Bitcoin in mind down to the circuitry. FPGAs are chips have the ability to be re-designed on the spot, down to their very connections, so they can be good at just about anything with the proper guidance. This isn't consumer tech. Instead, it's generally used in supercomputers, data centers, MRI machines, PET scanners, and the like. But this sort of flexible savant-level specialization is also great for mining Bitcoins, once you can teach the chip how to do it. An 8-core, pre-configured FPGA rig. It cost $2,000 at its introduction in January 2013. By then it was already very late to the game, offering 1/60th of the power of the Avalon ASIC which was released the following month for less. The jump from GPU rigs to FPGAs didn't bring on a power-increase of multiple orders of magnitude, in the way the jump from CPU to GPU had. It did, however, provide a modest power bump, and actually reduced the amount of electricity necessary to get competitive hash-rates. But perhaps most importantly, FPGAs served as a final vaulting point into the next—and final—massive revolution in Bitcoin machinery: truly specialized hardware. 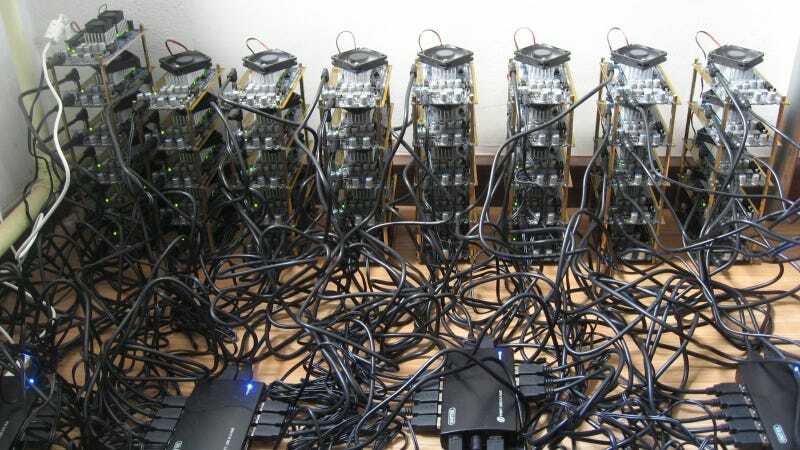 The first Application-Specific Integrated Circuit Bitcoin mining machines burst onto the scene in February 2012, bringing a new paradigm of power along with them. Unlike FPGA systems, ASICs are not malleable; they are set in stone silicon. And for that rigidity, they offer 100 times the hashing power of a FPGA setup and actually use less power. No conceivable system could ever have Bitcoin buried any deeper in its technological soul. ASIC systems have turned the Bitcoin mining rig from something necessarily hacked-together and jerry-rigged to something necessarily made-to-order; no miner can fab his own chips in the garage. Ultimately, ASIC devices are the last great innovation in Bitcoin mining; once you've specialized down to the chipset, there's nowhere left to turn for a 100-fold computing power increase. And in that way, we're seeing the beginning of the end of the gold rush, just as Bitcoin fever reaches a fever-pitch. As ASIC units continue to penetrate the mining market, competitive advantage is going to come primarily from more power efficiency; not by mining more Bitcoins, but by spending less electricity to mine the ones you can. The land-grab is almost over. Now it's how efficiently you work it. Meet the Avalon ASIC. Money cannot buy a better Bitcoin mining machine. It was designed and built front to back with Bitcoin mining and Bitcoin mining alone in mind. It cannot do anything else, but it cannot be beat at what it does. Inside its unassuming grey case is an army of specialty chips that promise 65 gigahashes per second. This is $6,800/฿72.36 equipment (at the time of this writing) that, properly utilized, stands to be worth much more. It's the beginning of the end of revolutions in Bitcoin mining. It is the endgame of an arms race. As of now, Avalon ASICs have been the only systems to actually ship, though they're exceedingly rare, numbering only in the hundreds. Still, this handful of machines now accounts for such a large share of the collective mining community's power that they've all but completely destroyed the viability of anything that came before them. And while Avalon started the revolution, others are not far behind. Companies like ASICMiner, Butterfly Labs, and bASIC all offer similar systems—some that boast even more power—but none of those have managed to ship. By the time they do, if they do (many are accused of being cash-grab scams), it may already be too late to justify their multi-thousand dollar costs. Granted, many of these theoretical machines offer a little more power than the current, existent Avalon machines, but you'd rather a real machine with less power right now than a concept with more later. The Butterfly Labs BitForce Mini Rig SC, a 1,500 GH/s machine. It's about 30 times more powerful than then current Avalon ASICs, or would be if it ever exists; its shipdate continues to be delayed. With every passing month, that higher hashrate becomes less and less of an advantage, especially considering the machine's unlisted but doubtless obscene pricetag. Bitcoin has always favored early adopters, bold ones especially. Because mining difficulty increases to compensate for increased power, all advantages are temporary. But it doesn't increase dynamically. Instead it hops up once every 14 days, so advantages can be leveraged. The first Avalon ASIC to be put to use paid for itself in a mere nine days, but every additional unit that follows will have more and more ground to make up. In the meantime, the price of Bitcoin continues to bounce around wildly, and whether or not it's up at any given time is going to dictate whether running these behemoths makes money or costs it. So long as it's a safe bet that Bitcoin isn't losing its value forever though, these suckers will keep chugging along. It's not impossible that some unlikely future event—widespread lack of interest, or the destruction of a huge share of existing mining rigs—could shake up the Bitcoin mining scene someday, giving older methods a chance at renewed relevance. But for now the future of Bitcoin mining is locked up in expensive, specialized, multi-thousand dollar boxes that sit in the corner and hum. And whether that's "stable" or "boring" all depends on if you've got one.